Toggles the SSR (Screen Space Reflections) effect for water on and off. Toggles increased accuracy for the water SSR (Screen Space Reflections) on and off. This option reduces visual artifacts by increasing accuracy of the last step. Toggles the wetness effect for objects near the shoreline on and off. Toggles rendering of underwater shafts on and off. Toggles rendering of environment probes on the water surface on and off. 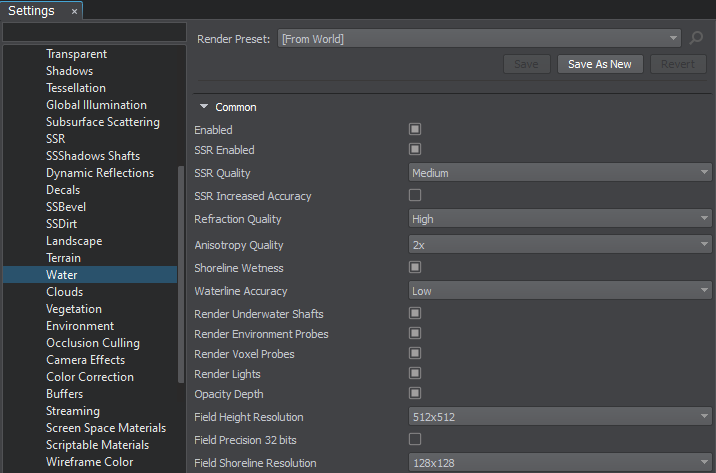 Toggles rendering of lights on the water surface on and off. Toggles writing of water depth in the opacity buffer on and off. Enables 32-bit precision for of textures used for field objects.